Aristoleo® Test Kit – What is it? Aristoleo® Recipes“Let food be thy medicine and let medicine be thy food.” We at Aristoleo consider this quote by Hippocrates to be a worthy theme for our High Phenolic Olive Oil recipes. It was Hippocrates’ reference to the medicinal benefits of early harvest olive oil made from green olives, along with a similar reference in Dioscorides’ Materia Medica that sparked the curiosity and subsequent research by Dr. Prokopios Magiatis and Eleni Melliou. This led to the method to measure the healthful phenolic compounds in olive oil using the sophisticated NMR (Nuclear Magnetic Resonance). This in turn, led to the invention of the Aristoleo Test Kit. Modern research continues to find the evidence of the health benefits of polyphenol rich olive oil, especially those rich in oleocanthal and oleacein. We invited Theresa James to create and share healthful and gastronomically pleasing dishes using High Phenolic Extra Virgin Olive Oil along with a cornucopia of healthful ingredients including meat, fish, fruits, nuts, vegetables, herbs and spices. Visit our online Medium publication, “Beyond Organic, Beyond Extra Virgin” where we share these recipes along with a host of articles about research, news, events, brands and stories about High Phenolic Extra Virgin Olive Oil. Prostate Pilot StudyThis captures all of Athan’s posts about the clinical trial for oleocanthal applications for prostate cancer treatment. Aristoleo® Test Kit is an invention for measuring the amount of oleocanthal and oleacein in olive oil quickly and inexpensively. It is based on the sophisticated NMR (Nuclear Magnetic Resonance) method, which tests and measures olive oils for their full phenolic profile – over 9 major phenolic compounds. The Aristoleo® Test Kit was created by Dr. Melliou and Dr. Magiatis at the University of Athens. Aristoleo® Test Kit has awarded the first prize for innovation in the 2015 annual Eurobank Greece Innovates award. Magiatis and his team at the Kapodistrian University of Athens continue to Aristoleo on Kainotomeis. A’ Award to Mr. Prokopio Magiati from the National & Kapodistrian University of Athens Pharmaceutical Department for ARISTOLEO: New test measuring the health protective properties of olive oil. Aristoleo™ Test Kit Instructional video English from Athan Gadanidis on Vimeo. ΝΕW Aristoleo Instructional Video June 16 2016 from Athan Gadanidis on Vimeo. Aristoleo® Test Kit is for professional use only and can be purchased by companies involved in the olive oil business. It is NOT available for retail sale or use. Instructions must be followed carefully to get best results. All safety precautions must be adhered to as outlined in the MSDS sheet provided for using the Aristoleo® Test Kit. Local bylaws must be followed for its safe disposal. The Aristoleo® Test Kit consists of a 12 ml vial, which is used to mix 3 reagents and the sample of olive oil. The liquid separates from the olive oil and changes colour. It normally takes 45 minutes at room temperature (25 degrees Celsius) to reach the final result. Instructions for accelerating the process are included. 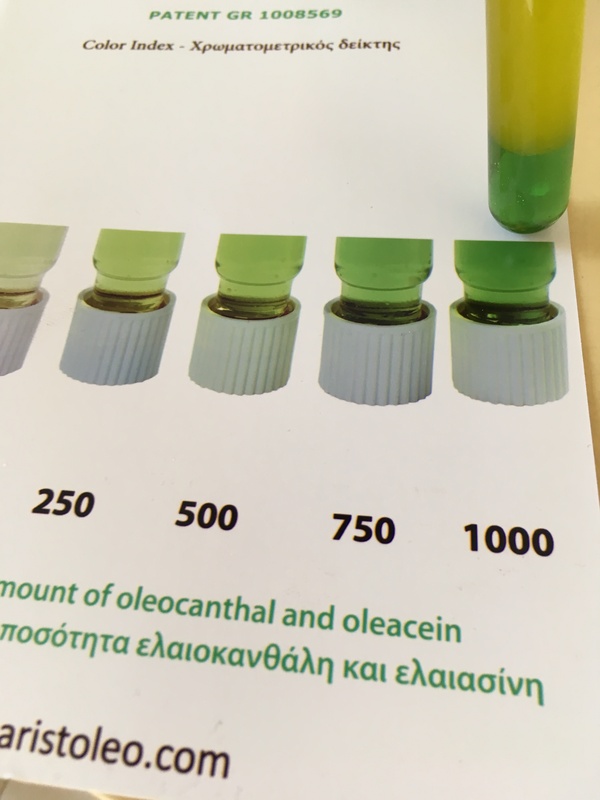 The colour determines the amount of oleocanthal and oleacein contained in the sample olive oil. A reading can be taken in as little as 20 minutes from beginning to end. It can be estimated by the naked eye when compared with a colour chart. Why measure oleocanthal and oleacein in EVOO? The simple answer is to get a better price for your olive oil. Over the past five years research into the health benefits of olive oil has increased and the findings are pointing to oleocanthal as a powerful preventive and health promoting phenolic compounds that may even reduce the the negative side effects for people of chemotherapy for cancer. Research is ongoing on preventing, reducing symptoms or even as an adjunct to therapy of many other ailments or conditions such as cardiovascular disease, neurodegenerative illnesses such as Alzheimer’s and Parkinson’s and autoimmune disease like rheumatoid arthritis and Type II diabetes. Oleocanthal is a natural preservative and a powerful anti-inflammatory compound, and scientific research is promising for its potential preventive or perhaps even therapeutic effects. Health conscious consumers are recognizing the value of high phenolic olive oil more than any other phenolic compound in EVOO. Oleacein is the most powerful anti-oxidant phenolic compound in EVOO. The EU has created a new category of EVOO by accepting the EU 432/2012 health claim labelling regulation for olive oil polyphenols. High phenolic olive oils, particularly those rich in oleocanthal and oleacein, are being recognized by health conscious consumers looking for natural foods to maintain health and vitality. Today’s consumers are more educated than ever, largely because they have access to more information than ever—and that’s only going to continue. So when it comes time to shop, consumers are putting that knowledge to use, and they’re making their selections carefully and for specific purposes. They’re also willing to pay for products that meet their specific needs, and for many, those needs revolve around knowing exactly what’s in—and not in—the items they buy. What this means to olive oil producers is that when they provide a superior high phenolic olive oil backed with conscientious farming practices, transparent labelling of ingredients and health benefits, their product will fetch a higher price. Whether the producer bottles or sells in bulk, he or she has the negotiating power of proof of quality and value. Aristoleo® Test Kit is a quick and inexpensive way to sort oils for high oleocanthal and oleacein at time of processing. Oils high in oleocanthal and oleacein can then be tested by NMR for full phenolic profile. The number of awards including Aristoleo® Awards is increasing which base the winning criteria on phenolic content in recognition of the EU health claim. Many producers also use the Aristoleo® Test Kit to demonstrate to potential customers their quality of olive oil over some higher priced brands of lower quality. Seeing is believing. Owned and operated by Artemis Alliance Inc. Copyright © Aristoleo™ Kit patent pending 2014 All rights reserved. Unauthorized copying or reproduction of any contents of this website is strictly forbidden. All content found on the Aristoleo.com website, including: text, images, audio, or other formats is created for informational purposes only. Content is not intended to be a substitute for professional medical advice, diagnosis, or treatment. Always seek the advice of your physician or other qualified health provider with any questions you may have regarding a medical condition. Never disregard professional medical advice or delay in seeking it because of something you have read on this website. Copyright 2015 - 2019 Aristoleo Ltd.